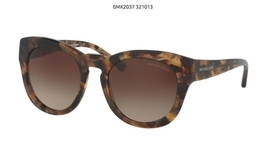 Michael Kors Sunglasses, Highest quality prescription Rx - Eyeglasses.com since 1999. Michael Kors sunglasses are designed by the world-renowned, award-winning designer of luxury accessories. The designer currently produces a range of sunglasses under his signature collection. The sun collection is mostly acetate full frames with large eye sies in rounds, modified rounds, and large square shapes. Michael Kors is a man with an innate sense of glamour and a keen eye for timeless chic, which is attested to by the numerous awards and accolades he has receive over the years. He has also been lauded for his philanthropy, fighting hunger by distributing meals to the needy in New York City. In 2013, he partnered with the United Nations World Food Programme (WFP) to help fight world hunger by designing the 100 Series watch. A portion of the proceeds from his special-edition timepiece helps WFP deliver food to children through its school meals program. Michael Kors stores can be found in major cities and malls around the world, including New York, Beverly Hills, Chicago, London, Milan, Paris, Munich, Istanbul, Dubai, Seoul, Tokyo, Hong Kong, Shanghai and Rio de Janeiro.